London Days: Rainbows and Butterflies! Wow what a sunny day it is here in London. I have been sunbathing on our balcony and even got a bit of a tan. 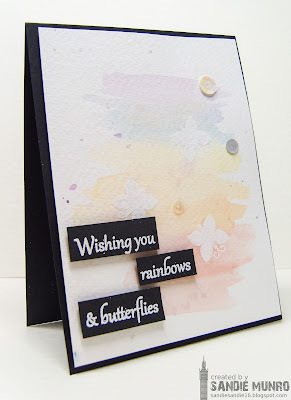 I heat embossed these tiny butterflies from CAS-ual Fridays then water coloured my rainbow. The sentiment is also from CAS-ual Fridays. I performed some stamp surgery and then heat embossed it onto black card stock and popped it up on foam pads. It is beautiful here too. Wish this weather would stay all year. love the soft rainbow of watercolor. So soothing. This card is absolutely lovely! I thought it was so clever of you to make your rainbow of colors so soft. This card makes me feel comfort and peace. I also loved the detail of the butterflies showing up in your rainbow. Thank you so much for sharing your talents with us for this week's Simon Says Stamp Monday Challenge! What a stunning watercolor bg! I should try that one day... I'm too intimidated! I love the contrast from the black. The soft pretty background is lovely, Sandie, looks great with the black and white. What a fab pastel w/c wash background Sandie. The white embossed butterflies and black sentiment strips are such a contrast.